SSC CGL Tier 1 Result 2016: The Staff Selection Commission (SSC) has conducted the Combined Graduate Level examination (CGL) from 27th August 2016 to 11th September 2016. The examination has conducted on Computer Based Mode in 43 batches in various centers. According to the official source of SSC, the SSC CGL Tier 1 Results are to be declared today on November 8. The Official website has announced the SSC CGL Tier 1 results declaration date on October 14. In that official notification, they mentioned that the exam was conducted about 415 centers in 96 cities across the country. But, 15 lakh candidates only appeared out of 38 lakh registered candidates. Due to some reasons, the administrative was also conducted the re-examination for the second shift on October 27 for those who all appeared on the exam on August 27 at 4.15 PM to 5.30 PM. 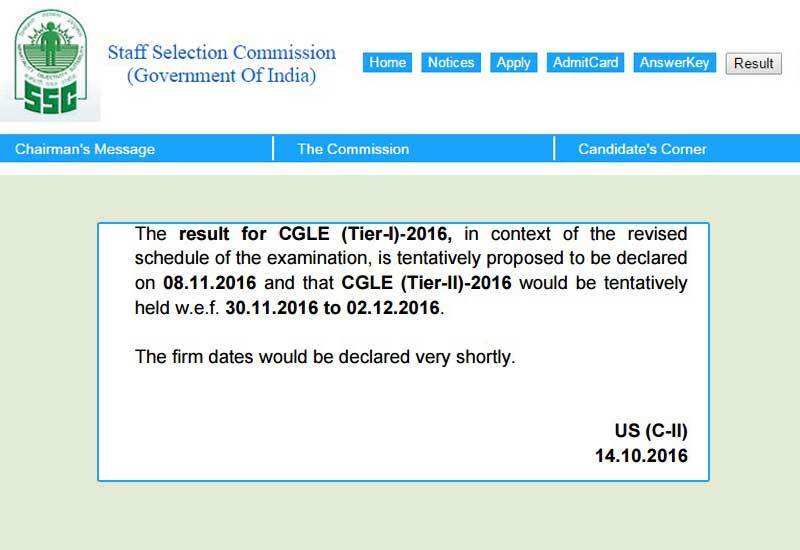 The notification had also mentioned the tentative exam date for the CGL Tier 2 as 30th November 2016 to 02nd December 2016. The Staff Selection Commission is conducting the exams for every year to fill the vacancy of various department of India Government. Here, it the screen shot of the official notification about the declaration of SSC CGL Tier 1 result. The officials have mentioned it as CGLE Tier-I Result 2016. Check the SSC CGL Tier 1 Result 2016 Below. The Staff Selection Commission will be declared the official SSC CGL Tier 2 – 2016 exam dates as soon. The Chairman has also stated that the final results will be announced at the end of April 2017. Read the Guide to Get the SSC CGL Tier 1 results here below. Candidate can be able to view the Result Tab at the 6th position of Tab section on top of the page. Also, the candidates can click the result notification link which provided in the notification (Latest News) field. Click any one of the links and visit the next page. If the candidate clicked the Result Tab, the result notification links have appeared with the tabs of CGL, CHSL, Steno C & D, and more results tab. Check the SSC CGL Tier 1 Result 2016 notification in the CGL tab. If the candidate clicked the homepage notification link, then the next page will be appeared to fill the details of registration number and so on. Ten Click the Submit button. The Result will appear on next page. Download / Save / Print it for future reference. Share this News with the people those who all attended the SSC CGL Tier 1 Examination. And Stay tuned with WORLDHAB for the latest news of SSC and other exam results update.